My son got sent home from school last Wednesday with a fever and horrible cough and never quite recovered. We spent Memorial Day in urgent care and got a diagnosis of "a touch of pneumonia." So, that was fun. Who gets pneumonia on Memorial Day?? That's what oppressive Wisconsin winters are for. Someone needs to send the bacteria in my son's lungs a memo. Anyway-so we are home today for one more day of rest. I'm telling myself that I need to at least catch up on some housework and laundry if I'm going to get horrendously behind at work. One aspect of my life should maybe feel like it's semi-under control. But why start now?? Instead-I've been perusing the Anthropologie website and coveting this insanely fabulous lamp shade. I must have it. It shall be mine. It needs me-we need each other. It's our destiny. Isn't it just lovely? Can't you hear it calling my name? 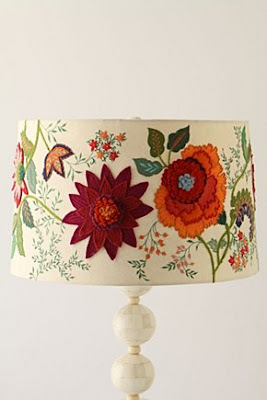 I just need to come up with a rationalization for spending $128 on a lamp shade. Hmmm... that's going to be hard to come by since both of our cars just decided take a crap at the same time. Ugh. Also-I lost the charger for the battery in my camera. It's like a big crapfest around here, I tell ya! I'm going to go back to clicking through all of the wonderfully unnecessary items at Anthropologie and pretending that I'm not really having a terrible, horrible, no good, very bad day.